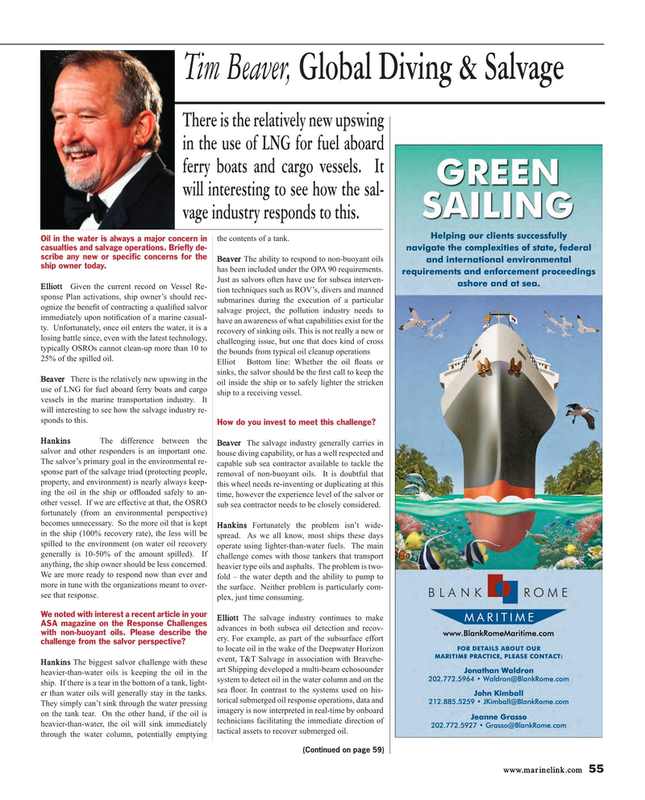 There is the relatively new upswing in the use of LNG for fuel aboard ferry boats and cargo vessels. It will interesting to see how the sal- vage industry responds to this. the contents of a tank. Beaver The ability to respond to non-buoyant oils ship owner today. has been included under the OPA 90 requirements. Elliott Given the current record on Vessel Re- tion techniques such as ROV’s, divers and manned sponse Plan activations, ship owner’s should rec- submarines during the execution of a particular ognize the bene? t of contracting a quali? ed salvor salvage project, the pollution industry needs to immediately upon noti? cation of a marine casual- have an awareness of what capabilities exist for the ty. Unfortunately, once oil enters the water, it is a recovery of sinking oils. This is not really a new or losing battle since, even with the latest technology, challenging issue, but one that does kind of cross typically OSROs cannot clean-up more than 10 to the bounds from typical oil cleanup operations 25% of the spilled oil. Beaver There is the relatively new upswing in the oil inside the ship or to safely lighter the stricken use of LNG for fuel aboard ferry boats and cargo ship to a receiving vessel. vessels in the marine transportation industry. It will interesting to see how the salvage industry re- sponds to this. We are more ready to respond now than ever and fold – the water depth and the ability to pump to more in tune with the organizations meant to over- the surface. Neither problem is particularly com- see that response. plex, just time consuming. ASA magazine on the Response Challenges advances in both subsea oil detection and recov- with non-buoyant oils. Please describe the ery. For example, as part of the subsurface effort challenge from the salvor perspective?